This is the first part of our fencing series which gets down to the nitty gritty of what we know best here at Owatrol – protecting your wood. The first thing to say is that we would always recommend first treating new wood with our new wood protection Seasonite and then allowing it to weather naturally for the first year. This is because new wood needs some time to settle into its new environment and if left unprotected can take in and let out moisture excessively causing warping or splitting. Of course, you could just go straight on with your chosen wood protection product but this does not give the wood’s pores time to open naturally and the mill glaze, present on new wood, would prevent the product from penetrating properly and therefore the level of protection would not be the same. In this post we will deal with the first, and in the following two posts we will look at the others – got it? Penetrating wood oils are an excellent way to achieve long-term outstanding protection for your exterior wood surfaces. They penetrate deep into the pores of the wood, saturating it and preventing any moisture from entering. Also, as they protect from within, they do not form a film on the surface of the wood and so will not peel or flake. 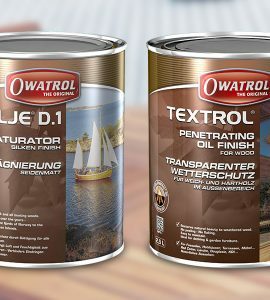 With solutions from Owatrol, there are 2 options if you are looking for a saturating wood oil – Textrol and Deks Olje D1. Textrol saturating wood oil is one of Owatrol’s flagship products and it really works wonders. Textrol is designed specifically for weathered wood and is available in several different colors. It can be purchased in quantities of 1 L, 2.5 L, 5 L and 20 L. As a general guide you would need 1 L of Textrol for every 5m² that you need to cover. Application of Textrol is quite simple really but assuming you have followed our advice of treating first with Seasonite and leaving the wood to weather for a year we would always recommend cleaning your wood and restoring it’s color with Net-Trol first (see our guide for how to clean your fence with Net-Trol) for the best results. To apply Textrol to weathered wood first ensure the wood is fully dry (preferably allow 2-3 completely dry days after cleaning) although we know this can be difficult to guarantee with the British weather! You can use a brush, roller or garden sprayer to apply the Textrol and you should apply an initial coat and allow 15-30 minutes for it to be absorbed into the wood. The important thing to remember about Textrol is that it should be applied wet-on-wet which means that you should not allow the surface of the wood to dry between coats. This is because Textrol’s place is in the wood and not on top – if you allow it to dry then the Textrol which has been absorbed will prevent the new coat form penetrating the wood! Continue to apply new coats every 15-30 minutes until no more can be absorbed – the actual number of coats with depend on the wood but for fences it shouldn’t be too many. Next make sure that you brush out or rub off any excess oil which is sitting on the wood’s surface using a brush or cloth to avoid shiny spots. And you’re done! Work your fence in panel sections to make sure that you are able to get back to where you started before the surface has become touch dry. Always do whole panels in one go though to ensure even coverage. Deks Olje D1 is different from Textrol in that it can be used on new wood (with some surface preparation) if you are looking for an immediate protection. D1 is a saturating wood oil which gives a clear matte finish that enhances the natural beauty of the wood and is easy to maintain as just like Textrol it requires no sanding or stripping! It provides outstanding protection against damage by moisture and UV rays and can even be used on interior wood as well as exterior wood. D1 is available in 1 L, 2.5 L and 20 L containers and as a guide you will need approximately 1 L for every 1-4m² you need to cover. To prepare your surfaces for the application of D1 you need to follow some simple instructions depending on whether your wood is new or you have allowed it to weather first. If your wood is new you should treat it with Aquanett wood oil remover (by simply applying and then brushing and rinsing) to help to remove the mill glaze which would prevent the D1 from penetrating the wood adequately. You should then neutralise the wood with Net-Trol and allow to dry fully before applying Deks Olje D1. If you are using weathered wood we would advise cleaning it with Net-Trol to remove any built-up dirt and restore the natural color – especially as Deks Olje D1 is a clear finish so you really want to see that natural wood color. Once your surface is prepared, the application process is much the same as Textrol. Begin applying the D1 with a brush or roller (please note a sprayer is only suitable for maintenance coats and not for initial application in this case) and be sure to work in sections which you can complete in around 15 minutes (for fences this is relatively easy as you can just work in individual panels or 2 or 3 panel sections depending on your application speed – always work in whole panels though). As with Textrol, continue to apply wet-on-wet applications of Deks Olje D1 until the wood is saturated and ensure that it does not dry out in between coats. The great benefit of saturating wood oils is the easy maintenance with no sanding or stripping needed and simple maintenance coats don’t take long at all. For more information about maintaining your fence see our forthcoming post in the series. If wood oils aren’t your thing, our next post discusses opaque finishes.